The Designated Substance Survey is designed to comply with Ontario Regulation 278/05 “Regulation Respecting Asbestos on Construction Projects and in Buildings and Repair Operations”. A Designated Substance Survey (DSS) is also required under Section 30 of the Occupational Health and Safety Act in order to identify and inventory designated substances that may be present. The purpose of the DSS is to report on the presence or suspected presence of readily accessible designated substances and hazardous materials which may be impacted during the continued demolition of the building and to provide recommendations, if required, to remove and manage these materials in accordance with provincial or federal regulations and guidelines. The designated substances and hazardous materials investigated during this DSS are asbestos‐containing materials (ACM), lead, mercury, silica, benzene, polychlorinated biphenyls (PCBs), and ozone depleting substances. The remaining designated substances, consisting of acrylonitrile, arsenic, coke oven emissions, ethylene oxide, isocyanates, and vinyl chloride, are not expected to be present in this type of building, however were noted if observed. The Ontario Occupational Health and Safety Act requires that a list of all “designated substances” at a project site be provided to all bidders at the tendering stage and that the “constructor” for a project shall ensure that each prospective contractor and subcontractor for the project has received a copy of the list before entering into a contract. 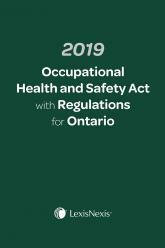 In addition, legal requirements which apply to health and safety on construction projects are set out in the Ontario Occupational Health and Safety Act and regulations made under the Act. The Occupational Health and Safety Act specifies, in general terms, the duties of employers and others to protect workers from health and safety hazards on the job. These duties include taking all reasonable precautions to protect the health and safety of workers and acquainting a worker or a person in authority over a worker with any hazard in the work and in the handling, storage, use, disposal and transport of any hazardous materials. The Regulation for Construction Projects, O. Reg. 213/91 (amended to O. Reg. 85/04), applies to all construction projects, and requires the use of appropriate personal protection equipment, training in the use of protective equipment and the provision of adequate washing facilities. The Occupational Health and Safety Act, in accordance with ONTARIO REGULATION 490/09 DESIGNATED SUBSTANCES allows for certain toxic substances to be especially designated. This means that specific regulations are constructed for the control of these substances in the workplace. Accordingly, each Designated Substance Regulation outlines a set of required steps to control exposure of workers to the substance.